Psycho Neuro Endochrine Balancing – PNE Balancing – also known as Chakra Balancing is a multi-modal treatment that has been producing remarkable results for healing and balancing. Here is a great article about it. The purpose of this article is to introduce a method called PNE balancing therapy, which can be effective in evaluating and treating a wide range of mind-body (psychosomatic) complaints. Every health care practitioner has encountered patients who do not respond favorably to well-chosen treatments. Even after trying several therapeutic approaches, perhaps even referring the patient to other professionals, there is no substantive improvement. This experience is frustrating to both patient and therapist. We see this in patients with chronic pain, chronic fatigue, weight issues, addiction, depression, mood disorders, and many organic diseases. Countless patients with such complaints have been referred to mental health professionals, and have often ended up on long-term psychotropic drug regimes that may cause additional forms of suffering. Is there a better way? The revolution we call mind-body medicine was based on this simple discovery: Wherever thought goes, a chemical goes with it. This insight has turned into a powerful tool that allows us to understand, for example, why recent widows are twice as likely to develop breast cancer, and why the chronically depressed are four times more likely to get sick. In both cases, distressed mental states get converted into the bio-chemicals that create disease. The medical field of psychoneuroimmunology (PNI) works with the specific pathways by which negative or fearful emotions suppress the immune system. PNI therapies include creative visualization, positive affirmations and other methods to raise the spirits of the patient, in the hopes of strengthening his or her immune system. Such approaches are credited with promoting cancer remissions and longevity in HIV/AIDS patients. Acupuncture is often effective for addressing mind-body disorders. Chinese medicine is one of the oldest medical systems that recognizes the interrelatedness of mind-body-spirit. The association of the liver with the hun, or ethereal soul, and the kidneys with the zhi, or will principle, are two of the various pathways acupuncture offers for approaches to mental and emotional illness. The names of many acupuncture points also suggest mind-body connections, such as spirit’s door (H 7), soul’s door (UB 42) and will’s residence (UB 44). Ayurveda is a traditional Indian healing system that recognizes the mind-body connection. It uses healing sounds, gemstones, diet, colors, and much more to harmonize and heal the body-mind. Ayurveda also works with seven or more chakras, or energy centers, within the body to evaluate and treat mind-body disorders. In my rather eclectic path of healing, I have investigated and practiced many aspects of Chinese and Indian traditional medicines. I have long been motivated to find effective therapies to successfully help people seemingly “stuck” into repeating patterns of pain and disease, even after years of searching through various medical and healing systems. I have found that a synthesis of certain aspects of ayurvedic chakra color therapy with Chinese acupuncture meridian treatment has yielded very good results for many of my patients. Because the use of Sanskrit and Chinese terminology may create walls to understanding for some people, I have sought terminology for this mind-body approach that “goes down easier” for Western patients and physicians. 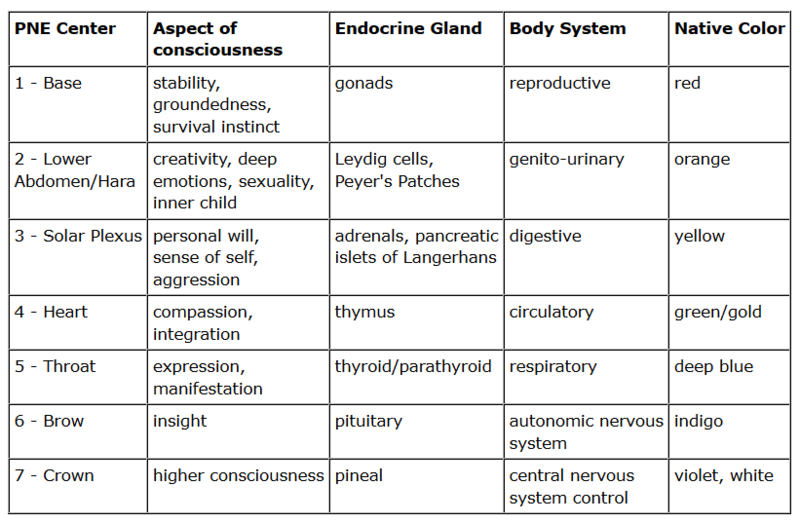 I have updated the ancient term “chakras” to “psychoneuroendocrine regulatory centers”, or PNE centers for short. Although long, this name offers a useful means to understand how these energy centers regulate health and well-being on a Western scientific basis. Diagnosing and treating through these centers is the most effective and direct way I have found to access the internal “control panel” for the underlying causation of physical and emotional suffering. Each PNE center is, in effect, a transformer or switching station that steps down the very high frequency of pure spiritual white and golden light energy. This allows universal energy to be utilized in a healthy way by our physical organs and tissues. If universal energy were not stepped down to lower frequencies in this way, our physical bodies would literally burn out, in the same way that a radio would fry if plugged into a 220 volt outlet! This stepping down of energy creates a series of wavelengths of light in the body. Each wavelength is perceived as a color by our inner and outer senses. The “native color” of each PNE center is what is produced by the stepped-down wavelength at that level. It is important to point out that the native color listed for each center on this chart is not necessarily the best one to treat it with! In many cases, the patient will already have too much of the native color and may need a complementary or balancing color to correct the disorder. We may understand the call of the body/mind complex for needed colors “color hunger.” I have observed many people expressing a strong desire or unspoken need for a specific color. As light of that color is applied to acupuncture points on their bodies, they have often experienced immediate or delayed beneficial reactions, such as deep relaxation, mental clarity, increased energy, or relief of various somatic symptoms. Each PNE center is a swirling vortex of electromagnetic energy. The original Sanskrit word chakra literally means “wheel” to describe what a chakra looks like. These centers have a characteristic spin pattern, just like a tornado or whirlpool. There are various methods of reading the spin pattern of a PNE center, including dowsing with a pendulum, hand scanning, muscle testing (kinesiology) and aura photography. Spin patterns I have observed have included clockwise, counter-clockwise, diagonal, horizontal, vertical, and cloverleaf. Each pattern has a characteristic interpretation in mind-body medicine. For example, a clockwise, even spin usually indicates good health, with the size of the spin revealing the energy level of that center. A horizontal, back-and-forth movement usually suggests that the person has partially or completely closed off the life force in that center due to some form of trauma or denial of an aspect of self. Once the practitioner has understood and memorized the consciousness and glandular associations of each center, observing the spin patterns provides valuable insights into the underlying causation of pain and disease. With a bit of intuitive synthesis, a whole story emerges that may help make sense of the varied complaints of the patient. As expressed by the famous equation E = MC2, all matter is simply slowed-down energy. All pain and disease stem from a distorted or incoherent energy patterns within the organism. These patterns are held in place by belief systems and conditioned consciousness responses of many kinds, and are reinforced by poor diet, lack of exercise and toxins. The most direct form of healing is for the patient to change his or her self-beliefs to ones that are more accepting, loving and trusting in spiritual source. It is often quite hard to make such changes, however. If it were easier, the patient would probably not be visiting you! Feeding the color hunger of a client with therapeutic colored light often acts to “jump-start” his or her own ability to shift one’s consciousness for the better. Healing sound and frequencies of microcurrent can act in the same way, although light seems to be the most powerful and direct therapy for this purpose. PNE therapy consists of the application of color light, sometimes with simultaneous microcurrent and/or healing sound, to help open and balance one or more PNE centers. Appropriate colors can be selected through the same methods used to evaluate the centers – dowsing, muscle testing, pulse response (VAS) and others. After applying the energy to the centers, they are re-tested to see what degree of change in the spin has happened (if any). PNE therapy works very harmoniously with acupuncture, utilizing needle or non-needle microcurrent approaches. Each PNE center is associated with a group of acupuncture points, some on the trunk of the body and some distal. My experience is that when a distorted spin of a PNE center dramatically improves (goes back to clockwise and steady) after therapy, the client almost always reports a sense of increased well-being, pain reduction, or other symptomatic improvement. Sometimes, emotional releases will happen as part of the process. PNE therapy may be effective for the treatment of chronic fatigue (CFIDS), fibromyalgia, hormonal imbalances, overweight, chronic pain, cancer, depression, and mental illness. Concomitant use of psychotropic medications or chemotherapy may reduce effectiveness, although this is not necessarily the case, as consciousness overrides all. PNE balancing is a synthesis of Chinese and Indian traditional medicines with modern psychoneuroimmunology, that can be of great help to modern patients with difficult to diagnose and difficult to treat complaints. This is a fascinating and powerful process, one that cannot be adequately explained in this brief article. Fortunately, the process of PNE therapy is not difficult for practitioners to learn, and the greatest learning comes from actually going through this process with a series of clients in a state of receptive awareness. Getting regular PNE balancing feels great and can be a life changer. At Rejuvenate 528, we embrace this treatment and offer your first PNE balancing as a part of our Complimentary Introductory Package. Click here to learn more about our Services and see what we can do for you on your Rejuvenation Journey!